In the first book by Marvin Etheridge, “The Gnostic Warriors,” thirty-year-old Kan recalls his childhood in North Carolina during WWII, with his younger brother Del. During this time, he tried to piece together events from their youth to find the meaning behind what was really happening around them. 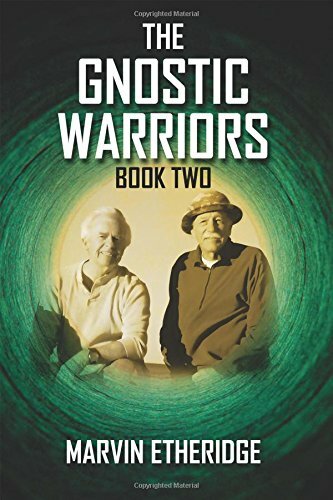 In this second book, "The Gnostic Warriors: Book Two," elderly Kan and Del agree to spend a week at a beach cottage where they had gone in their youth. They want to try to heal their relationship while still seeking answers from past events. They resume their roles as Gnostic Warriors and seek knowledge about the truth. What they discover is disturbing, however they are also still able to work towards being able to lay the bad memories to rest. The truth points to the fact that they were dealing with pure evil in human form. A surprise visit in the form of a childhood friend really shakes them up because now the whole truth is revealed and it is not only unsettling but dangerous. At least now they have all of their answers. Having read and enjoyed the first book, I found “The Gnostic Warriors: Book Two” to be even more riveting. The tragic events are laid out in greater detail and I was able to gain additional insight into what the brothers had been trying to block from their memories. They knew they had to get together to rehash everything because those blocked memories were impacting other areas of their lives, especially their relationships with each other. I found this story to read more like a biography than a fictional novel. Marvin Etheridge really brought these pages to life. The relationship between the brothers and how they interacted with each other was especially realistic. Readers who enjoyed the first book will enjoy stepping back into this story and I truly believe that they will appreciate it even more. It is not necessary to read the first book, however, I recommend doing so because it will make you more familiar with the whole complex background of these men. “The Gnostic Warriors: Book Two” by Marvin Etheridge is a great read!